Wireless does not mean wire free. That’s the unspoken truth about the current crop of Nest Cam imitators that Blink ($109), a truly cordless HD home security camera, hopes to exploit. Launched on Kickstarter in 2014, this battery-powered indoor cam promises unfettered mobility at a fraction of the cost of its competitors. But while price point and the idea of not being shackled to a power source are attractive, they come at the cost of many common features that are hard to overlook. Blink rejects the curvilinear forms we’ve come to expect from IP cameras in favor of right angles. The camera itself is a 2.75-by-2.75-by-0.5 inch square that can fit in the palm of your hand. It also comes with a sync module, another 2-by-2-ish square, that facilitates Blink’s setup and moderates its power usage. Both the camera and the sync module are made from lightweight plastic. The Blink system also includes an optional alarm, which we did not test. Blink offers 720HD video capture with a 110-degree field of view. When the camera’s sensor detects motion, Blink records a 5-second video clip (though this can be extended to 10 seconds). You receive a push notification with an attached video link so you can see the triggering event. Blink also has a built-in mic for monitoring audio in the home, and LED illumination for low-light environments. Thanks to its square design and lack of cords, Blink can be placed virtually anywhere. Currently, Blink provides free storage for up to 7200 seconds of video, or roughly 1440 five-second events. Once that limit is reached, Blink starts overwriting clips beginning with the oldest. You can also download, email, or share the videos from the Blink app. The Sync Module also features a USB port, and Immedia promises a Q2 firmware update that will let you use it to send video clips directly to onboard storage. Typically, home security cameras come out of the box ready to go, but Blink takes the notion of a DIY security camera a bit more seriously. The camera comes with with two lithium AA batteries and a mounting bracket, each of which you must install yourself. Performing these maneuvers, it became clear how slight the camera’s construction really is. Blink has less heft than my TV remote. That may be a concern if you take advantage of its increased mobility to place it on high shelves or mount it in an area where it might get bumped into frequently. Looking for the best home security camera? Check out our roundup, which looks at 10 of the latest models. To set up Blink, you first plug the Sync Module into a wall outlet, then launch the iOS or Android app. A wizard walks you through the process of creating a login and connecting to your Wi-Fi network. Though Blink certainly offers greater freedom of placement, it must stay within 100 feet of the Sync Module, which must remain connected to electrical power and the Internet. That should still provide plenty of flexibility, and the app’s signal strength meter will let you know when the Blink is pushing the range limit. Blink comes with a separate Sync Module that must remain connected to the Internet and a power outlet. Blink’s picture quality was impressive in both video and live streaming—at least during the day—particularly for a battery-powered camera. Images were crisp with little lag. After-hours video was more disappointing. Blink’s LED illumination shines white light into the room, and though it effectively brightens dark parts of the image, it tends to wash out lighter ones. And because it produces visible light—unlike the infrared LEDs most other home security cameras use for night vision—it will undoubtedly tip off any intruder that he’s under surveillance, giving him the opportunity to destroy the evidence. The Blink app lets you monitor multiple cameras (the Sync Module can accommodate up to 10 devices in any combination of Blink cameras and alarms), and it offers ample features for customizing and monitoring the camera’s performance. From your device you can adjust motion detection sensitivity (a must for reducing false alerts), change the default length of video recordings, and keep an eye on battery life, to mention just a few settings. But what’s more notable about Blink is the number of now-standard features that aren’t included. There’s no two-way audio, a popular feature for communicating remotely with kids, elderly parents, or pets at home. There are no audio alerts, which means you can’t detect suspicious activity that happens outside the camera’s field of view. And you can’t schedule Blink to automatically arm or disarm at certain times of day. Immedia says it will add some of these features in future updates, but right now their absence really dulls Blink’s luster. Blink is more affordable than most other HD home security cameras, and the free storage is undoubtedly attractive. But that cost savings is no longer enough differentiate it an already overcrowded market. 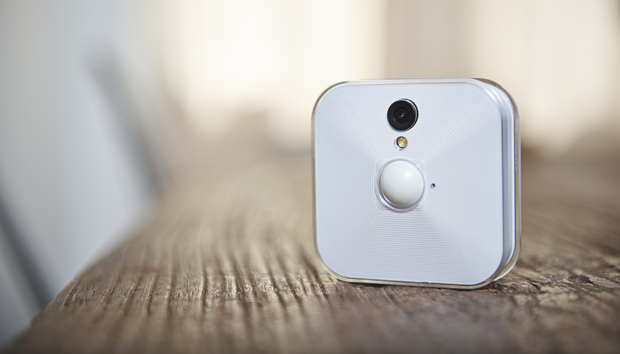 The idea of a small, inexpensive, battery-powered home security camera seemed novel when Blink’s crowdfunding campaign launched two years ago. But between then and now we’ve seen the arrival of Netgear’s cordless indoor/outdoor Arlo as well as the diminutive, budget-friendly EZVIZ Mini. And for a few sawbucks more than Blink, you can get a more full-featured security camera like Arcsoft’s Simplicam or Samsung’s SmartCam HD. If Blink wants to stand out in that company, it’s going to have to raise its game.